Have Valentine’s Day plans? Do they include drinking a ton of coffee? Well they should! 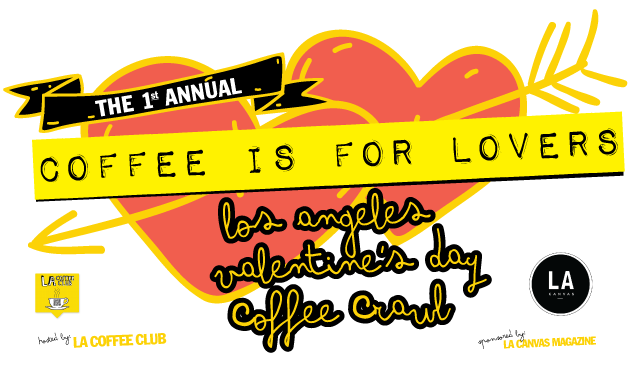 LA Coffee Club, an LA Zine Fest sponsor (and supplier of free coffee to vendors in the morning!) are having an LA Valentine’s Day coffee crawl! This free event, happening all day, gives people the opportunity to try all sorts of coffee, all over Los Angeles. Register online and check in at specified locations for a chance to win a romantic prize pack for two! If you fancy yourself a barista, enter the latte heart throwdown! starting at 6pm at Project Gallery + Espresso which is at 1553 N Cahuenga, and stick around for the afterparty (21+) starting at 9pm! Don’t forget to join the LA Coffee Club and get LA coffee delivered to your door!! !